What's the solution? Telling your iPhone to forget the wi-fi network. Forgetting a network will remove the network's password and prevent your iPhone from joining it automatically in the future. 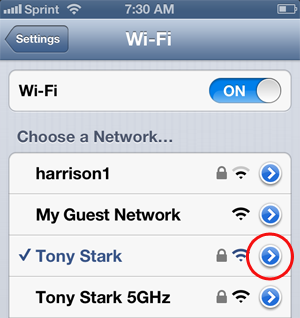 Locate the wireless network you want the iPhone to forget, and then tap the blue arrow next to the network name. The window shown below appears. Tap Forget this Network. The iPhone will forget the wireless network. You have successfully told your iPhone to forget the wi-fi network. The iPhone will not attempt to connect to the network in the future. And if the network required a password, that password has been forgotten.